The on-going digital revolution spurs retailers to adopt digitalized enhancements in-store (Helbing 2015; Catlin et al. 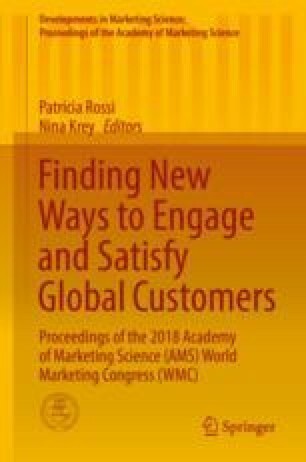 2015), which contribute to an improved customer experience and the integration of shopping channels (Rigby 2011; Davis 2014), continually shaping retail business models, as well as consumer behaviors (Verhoef et al. 2015). Fashion retailers in particular are increasingly adopting advanced technologies in their physical stores to enhance the shopping experience and contribute to retail competitive advantage (Pantano 2015; Bonetti and Perry 2017). Moreover, consumer-facing in-store technologies (CFIT), such as digital signage and interactive screens, AR and VR, i-beacons, virtual fitting rooms, etc. (McCormick et al. 2014; Bonetti and Perry 2017), are being implemented across the sector. Although previous studies on consumer-facing technology in retailing have focused on the consumer as the end user of the technology (Olsson et al. 2013; Lee at al. 2012; Dacko 2017), managerial perspectives on strategic objectives, drivers and processes for the adoption, and implementation of CFIT within the sector have been largely ignored. This study seeks to elucidate and critically evaluate the managerial processes involved in the adoption and implementation of CFIT within a fashion-retailing context in order to propose ways in which contributions to retail operations and competitive strategy may be leveraged. While much of the existing research on technology adoption pursues a quantitative design (Ghobakhloo 2012), it is recognized that there is a need for more interpretivist-led studies in order to better establish rapidly evolving managerial concerns in the digital age (Orlikowski and Baroudi 1991; Williams et al. 2009). A qualitative approach was therefore adopted. Data were gathered through semi-structured interviews with 28 technology providers, consultants and strategists, and relevant senior informants from 14 global fashion retailers during 2017 and 2018. Data analysis followed an established inductive process of applied thematic analysis (Guest et al. 2012; Miles et al. 2014). Starting from an initial open and free analysis (Corbin and Strauss 2008), initially identified codes and subcodes were refined as data collection and analysis proceeded iteratively (Spiggle 1994; Corbin and Strauss 2008). Initial findings from 56 h of interviews revealed that CFIT implementation may be related to a short-term initiative to generate “buzz” from a PR and marketing perspective or to strategically transform the in-store shopping experience by providing faster service or a more personalized experience. Here, CFIT is properly integrated to back-end technology and operations to provide a front-end service and advantage to the customer. This implies considerable changes to corporate mind-sets and company structures, leading to potential business model innovation.